I won't be adding much to the torrent of abuse that has been heaped upon Hazel Blears following her ill-advised speech to the Hansard Society. Ever since Comment is Free cannily ran a juicy extract - accusing political bloggers of corrosive cynicism, failing to "add value" to the political debate, and daring to express opinions without first being elected - the subject has been blogged to death. Almost all bloggers of note - and many of little or no note - have emoted about the awfulness of Blears, her condescending attitude, her supposed stupidity, her Rosa Klebbish tendencies, and - rather more thoughtfully - what the speech reveals about the authorities' disdain for genuine debate and their fear of public opinion, their paralysis in the face of a new media that they haven't yet worked out how to control. The debate has turned upon three axes: incredulity (doesn't she realise what a blog is? ); outrage (if anyone has contributed to cynicism and political malaise, it's NuLabour); and - to be honest - fear. In the context of the government's seemingly limitless love of surveillance and control, and recent discussion in the European Parliament concerning the "undetermined" status and authorship of blogs, some suspect an ulterior motive. That the speech might even be a softening-up exercise before some sort of anti-blog clampdown. That Blears' speech was incoherent, self-contradictory and frankly bizarre is a point I won't belabour. Strangest to my ears is her complaint that columnists "cannot be held to account for their views"; a statement which, apart from anything else, presupposes that views are the kind of thing for which anyone could or should be held to account. Politicians ought to be held to account for their actions: with a neutered Parliament failing to do the job, it has fallen to the print media and, increasingly, the blogosphere to fulfil that vital democratic function. Anger at the manner in which the political system has been manipulated and debased is not the same as cynicism: if anything, it's the reverse. By blaming disengagement from politics on the phenomenon of blogging Blears confuses the cure with the disease. The discussion on Comment is Free itself is worth following if you've the ocular energy. Elsewhere, Letters from a Tory is very good, as is Cranmer - and, from a different part of the political spectrum, the People's Republic of Mortimer. Old Holborn, gloriously, would seem to have gatecrashed the event. But all the anti-Blears points are fairly obvious - and if only the chipmunk and her colleagues could be bothered to take them on board, they might find the cynicism they bemoan start to diminish. I'm just saying. Something else caught my attention in HB's speech, though. Discussing the decline of working class participation in politics (and politics, for Blears, seems to be coterminous with the Labour Party) she asks this: My question is, whether we are witnessing by stealth the reversal of the Reform Acts of the nineteenth century? Blears was specifically addressing the low turnouts in recent general elections, especially in "Manchester, Liverpool, Glasgow, Hull and Salford." In other words - though she didn't put it quite so explicitly - safe Labour seats. But her point is a broader one. 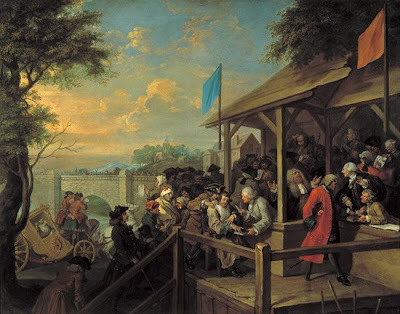 Are we returning to the pre-Reform days of pocket boroughs and political racketeering, when politics was a spectator sport outside a small Whig elite and the great mass of hoi polloi was looked upon by the ruling class as a gin-sodden and potentially seditious mob? Do we see interchangeable and often intermarried politicians swapping favours with merchant princes, with visual and verbal satire often the only means of popular redress? Are our newspapers filled with the doings of actresses and notorious criminals, while politicians try to censor and control the press? Do we observe interminable military entanglements abroad and a climate of fear and repression at home? Is our public entertainment characterised by cruelty, vulgarity and sexual innuendo? Possibly. But the 18th century wasn't so bad, politically. There were great orators - Pitt the Elder, Charles James Fox - and politicians of outstanding intellectual accomplishment, such as Edmund Burke. The younger Pitt came to prominence at an absurdly young age because of his family connections as much as his abilities - and it was via the rotten borough of Old Sarum that he entered the House. In towns such as Honiton and Preston, there was real democracy. The pre-Reform period ended with the distinguished figure of the Duke of Wellington in No 10 Downing Street giving up the struggle to maintain the ancient system of independent boroughs; but it was principally in order to preserve the status quo that the Whigs under Grey began the process of piecemeal reform that remains uncompleted to this day. Pre-Reform Act politics was characterised by its cosy, incestuous nature. It was not impenetrable by talented and charming outsiders, but it was essentially aristocratic and elitist. The Whigs considered themselves born to rule and entitled to their wealth and privilege, yet laid claim to high ideals of liberty enshrined in the Glorious Revolution of 1688. English notions of freedom ran deep: Hanoverian politicians were assured of nods of approval when they contrasted Britain with the absolutist tyrannies of continental Europe. Some, like John Wilkes, went so far as to put themselves at the head of the mob; they did so, however, always with an eye on their place in the established hierarchies of power. Call it fake populism; the present government knows all about that. (Wilkes, of course, fought for the right of the press to report Parliamentary debates, which in his day evidently mattered.) Opposition to the Georgian political establishment was boisterous, often obscene; no doubt Hazel Blears would have considered it insufficiently constructive and lacking in legitimacy (Tom Paine and Dr Johnson, by contrast, would both have been enthusiastic bloggers). But, lacking a grip on the levers of power - and without real democratic accountability - usually all the public and the press was able to do was hurl abuse. Occasionally, the mud stuck, and the more outrageous rogues were booted out. It was Peter Mandelson, a decade ago, who suggested that the "era of representative democracy might be drawing slowly to a close". In its place, I suppose, we shall see a system of "managed democracy", in which elections continue to be held and public opinion is consulted - and, where possible, told what to think. Real power will be exercised out of sight by people who owe their jobs to patronage and cannot readily be removed. It sounds a bit like the 18th century. With ID cards and RIPA. Yet again another superb blog. 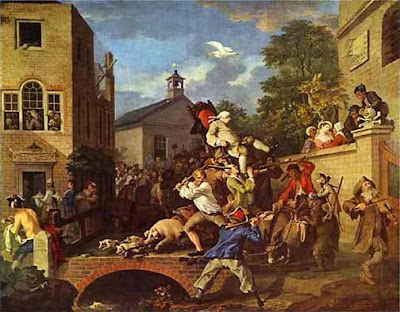 Nice Hogarth by the way! Only to say that I don't think Dr Johnson would have been a blogger. 'Only a fool writes for anything but money', as I recall! "Real power will be exercised out of sight by people who owe their jobs to patronage and cannot readily be removed." The prime example being the European Commission. With a Tory government in Westminster, will there be something for the traditional Labour base to fight against, and perhaps then a new wave of (better) politicians? Great point WC: the quote was "No man but a blockhead ever wrote except for money". However, I'm sure the good doctor would have found some way of making his blog profitable, and I suspect the long-windedly interactive nature of the medium would have suited his declamatory style of conversation rather better than conventional journalism ever did.